William Pitt the Elder (1708–1778), first Earl of Chatham, British Secretary of State and then Prime Minister of Great Britain, was largely responsible for the repeal of the Stamp Act of 1765. That act, which required all legal documents, permits, newspapers, and pamphlets in the colonies to carry a tax stamp, was a response to Britain's debts incurred during the Seven Years War (1756-1763), and the first attempt to impose a direct tax on the American colonies. Parliament repealed the Stamp Act in March 1766; when the news reached Charleston, the Commons House of Assembly commissioned a marble statue of William Pitt. 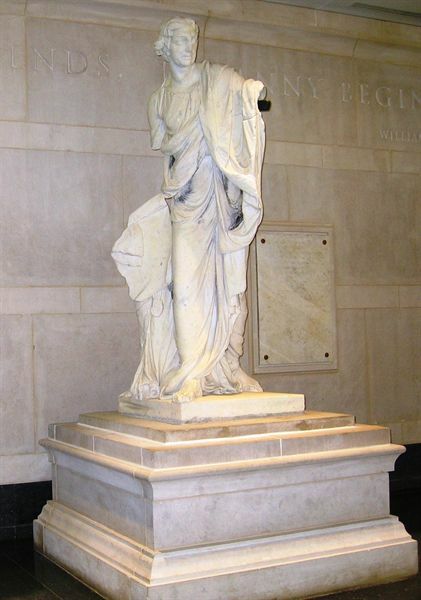 On order of the colony, English sculptor Joseph Wilton carved the statue, portraying Pitt dressed in a toga with one arm holding the Magna Carta and the other extended upward. The statue, escorted by one of Wilton's assistants, arrived at Charles Elliott's wharf via the ship Carolina-Packet on May 31, 1770. Citizens "of the highest rank" hauled it by hand "to the Arsenal, near the place where it is intended to be erected." On July 5, 1770, it was placed at the intersection of Broad and Meeting streets, on a pedestal erected by masons John and Peter Horlbeck. At the installation ceremony the Honorable Peter Manigault read the inscription “In grateful memory of his services to his country in general and to America in particular, the Commons House of Assembly of South Carolina unanimously voted this statue of the Hon. William Pitt, Esq. who gloriously exerted himself by defending the freedom of Americans, the true sons of England, by promoting a repeal of the Stamp Act in the year 1766. Time will sooner destroy this mark of their esteem than erase from their minds their just sense of his patriotic virtue.” After the dedication, the elite men of Charleston retired to Dillon and Gray's Tavern for speeches and forty-five ceremonial toasts. 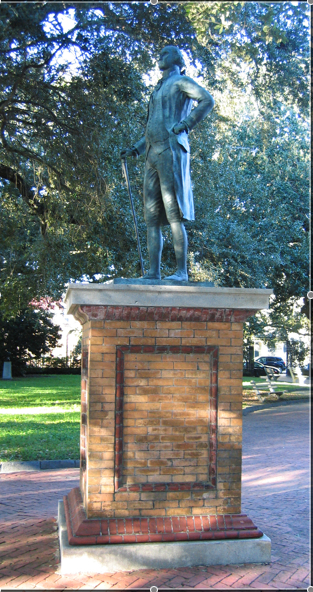 Pitt's statue was damaged in 1780 during the siege of Charleston, when British cannon fire struck the extended arm. 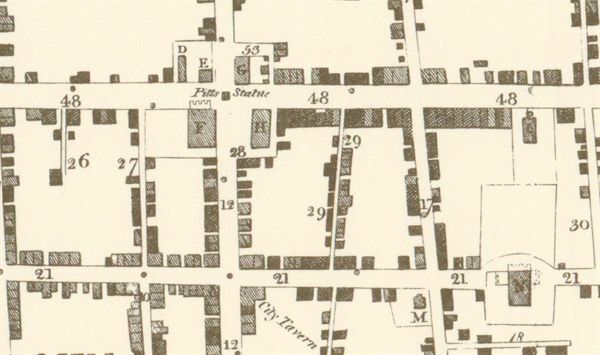 By 1791 it was considered a nuisance, partly because of its location in a primary street intersection, and partly because Pitt's vehement opposition to American independence still rankled in Charleston. In 1794, City Council contracted for its removal. Pulled from its pedestal by a rough block-and-tackle, the statue's head was broken off. Judge John Faucheraud Grimke bought the marble pedestal stones, and placed the inscription slab in his own garden (at today's 321 East Bay Street). The statue's pieces were "stowed away in some of the public buildings." By 1808, the statue lay, nearly covered by earth, inside the enclosure of the Charleston Orphan House. The orphanage commissioners received permission from City Council to erect it south of the building, facing Calhoun Street. There it remained, even after a much larger Orphan House building was completed in 1855. 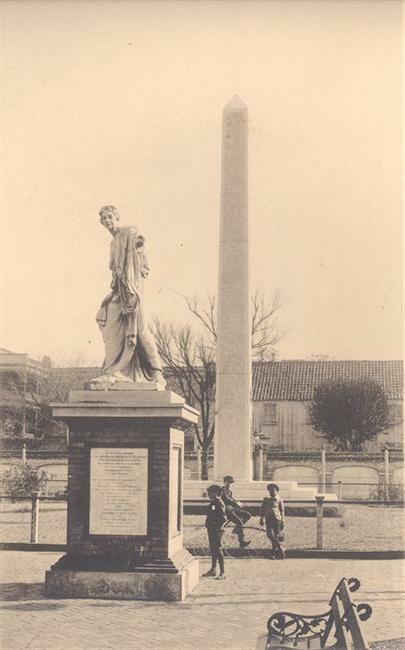 In 1881, acting on a request by the South Carolina Historical Society, the city moved Wilton's statue of Pitt again, this time to the public area behind City Hall, which was being redesigned as "Washington Park." The statue was set on a new pedestal of red and buff brick on a base of Fairfield County granite, with two marble inscription panels. One was the original, which John F. Grimke had given to the Orphan House in about 1808; one was a new tablet commemorating the relocation. 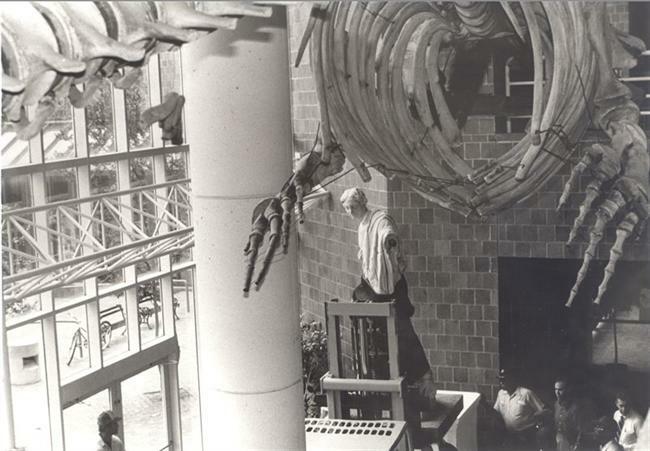 In a 1980s preservation initiative, the statue was moved inside the lobby of The Charleston Museum. In 2002, the statue of William Pitt was moved a final time. It now stands near its original location, inside the restored Charleston County Judicial Center at the corner of Broad and Meeting streets. After the eighteenth-century statue of Pitt was moved in 1985, its brick pedestal stood empty in Washington Park. Beginning in 1992, a committee headed by General William Westmoreland planned and raised funds for a new statue of George Washington. They commissioned Charleston artist John Michel to sculpt the bronze statue, which was dedicated in 1999. Nine feet tall, the new statue represents President Washington "standing as if in the moment of applause from enthusiastic and adoring Charlestonians" when he visited the city in May, 1791. Behre, Robert. "Saluting the General. Washington unveiled in his square." Post and Courier, December 15, 1999. Behre, Robert. "Washington returns to Charleston." Post and Courier, December 12, 1999. Borick, Carl P. A Gallant Defense, The Siege of Charleston, 1780. University of South Carolina Press, 2003. Burger, Ken. "Careful! 215-year-old statue moved inch by inch to Museum." News and Courier, April 24, 1985. Poston, Jonathan H. "Statue of William Pitt, Earl of Chatham." in Maurie D. McInnis and Angela D. Mack, eds., In Pursuit of Refinement. Charlestonians Abroad 1740-1860. Columbia: University of South Carolina Press, 1999. "A Relic of the Revolution." News and Courier, May 27, 1881. Smith, D. E. Huger. "Wilton's Statue of Pitt." South Carolina Historical and Genealogical Magazine 15 (1914). 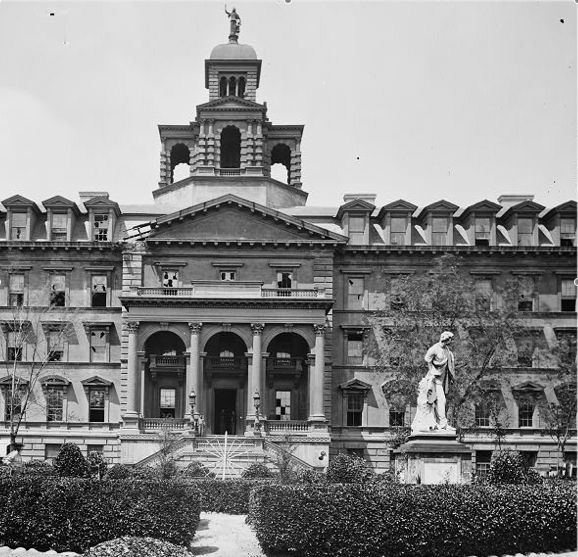 The statue of William Pitt stood in front of the Orphan House from 1808 to 1881. The statue of William Pitt stood in Washington Park from 1881 to 1985. 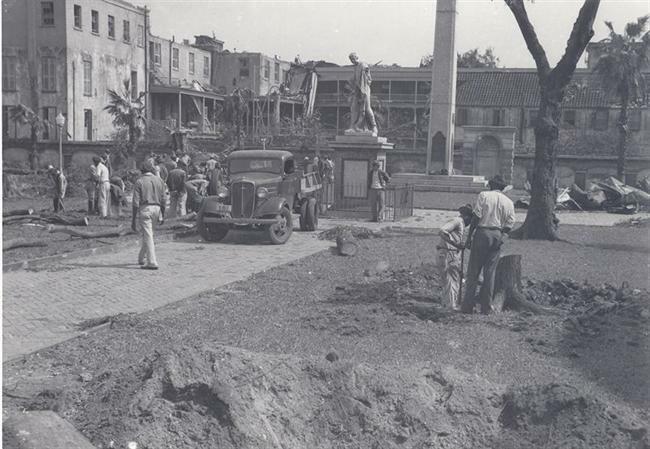 Washington Park and Pitt's Statue after the tornadoes of 1938. The statue of William Pitt was safely installed in the lobby of The Charleston Museum in 1985. Bronze statue of George Washington, dedicated in 1999. Until 1794, Pitt's statue stood facing east from the intersection of Broad and Meeting streets.